It’s a kind of preventative medicine pioneered by Dr. Lee Hood, a former California Institute of Technology researcher best known for helping develop automated tools that made it possible to map the human genome. Hood has played a role in founding more than a dozen companies, including Amgen, now a pharmaceutical giant. Hood’s latest venture is a Seattle company called Arivale, which was founded in 2014 and now has operations in Oregon and California. WSU plans to pay the company to train medical students in data analysis and “coaching” strategies that would encourage patients to adopt healthier lifestyles. 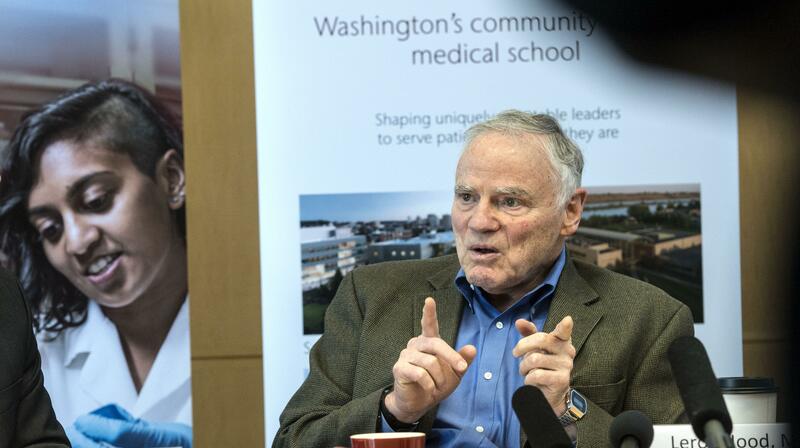 WSU’s medical school will be the first in the country to offer the sort of training in which Arivale specializes, Dr. John Tomkowiak, the school’s dean, said during a Tuesday morning news conference, where he was joined by Hood and other Arivale executives. That data includes “a person’s genetic profile, their gut biome, and metabolites or markers in their blood, as well as their own personal or social history,” Tomkowiak said. Arivale then pairs clients with licensed nutritionists who serve as lifestyle coaches, communicating almost exclusively through texts, phone calls and emails. The Arivale program focuses on six health “dimensions,” including diabetes risk, heart health, healthy aging, inflammation, optimal nutrition and stress management. The cost for the first year, which includes a gene sequencing, is about $3,500. The first class of 60 WSU medical students will begin their studies in August. They won’t be required to participate in Arivale’s training, but Tomkowiak said many have expressed interest. WSU spokeswoman Terren Roloff said Tuesday she couldn’t disclose how much WSU intends to pay Arivale because details of the contract were still being finalized. Hood pitched “scientific wellness” as an approach that could fundamentally transform health care. Arivale executive Jennifer Lovejoy said the company is unique – and successful – because it combines lifestyle coaching with massive amounts of carefully scrutinized scientific data. Published: April 11, 2017, 7:55 p.m. Updated: April 11, 2017, 11:14 p.m.